Llewellyn Howland established Concordia Company, Inc. in 1926. He named the company after a famous Howland family whaling vessel. In 1932 Llewellyn transferred the company to his son Waldo, and Marblehead racing celebrity, C. Raymond Hunt. They redrew the terms of the corporation to more closely fit with the boat business they had created and operated the company as a successful boat brokerage through the 1930's. 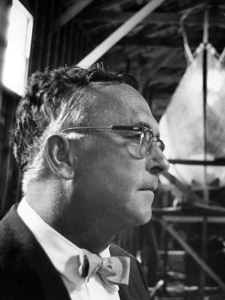 Concordia Company began designing boats to maximize Ray's talents. 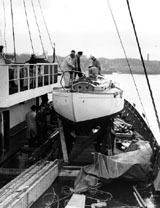 Its first design, a 12-foot frostbite dinghy, Plover, was built by Pat O'Connell, a former Lawley employee. 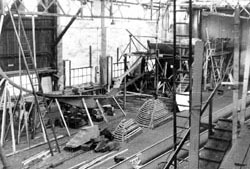 The company continued building frostbiters and other small boats until 1936, when it received its first commission for a larger boat - the 28-foot Weepecket. Commissions for larger boats continued and Concordia's name began to be associated with fine quality workmanship and well-designed craft. In 1938 the company moved from Boston to Fairhaven, Massachusetts, and added Wilder B. Harris to its staff as a naval architect. 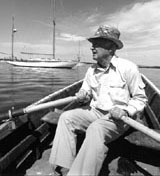 The move brought Waldo Howland closer to Buzzards Bay, where he had spent his boyhood years sailing. But the year also brought a devastating blow to the company in the form of the Great Hurricane of '38, which ruined many of the boats moored in Padanaram Harbor. Among those destroyed was the Howland family's own Escape, a Norwegian pilot boat designed by Colin Archer and built in 1890. Concordia yawl being delivered via freighter to Boston Harbor. 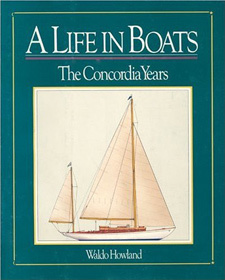 Concordia Company commissioned 103 Concordia yawls between 1938 and 1966. The German shipyard, Abeking and Rasmussen, constructed all but four of the yawls. Oyster Bay yachtsman Drayton Cochran commissioned the first Abeking and Rasmussen-built Concordia yawl, beginning the unique relationship that would develop between the two companies. Concordia yawls under construction at Abeking and Rasmussen. At the time they were building Concordias, Abeking and Rasmussen were primarily involved in building commercial vessels. The company was able to produce the yawl at a very reasonable price, leaving many of the final details to the Concordia yard to complete. The yawls were built out of a relationship of trust and good will - Abeking and Rasmussen actually shipped complete boats to Concordia before receiving final payment. By the 1960's, economic forces rendered it impossible to continue producing the yawls in Germany. Irene, hull #103, was the last Concordia to be shipped from Lemwerder in 1966. A tribute to the relationship between Concordia and Abeking Rasmussen sits in Concordia's office today. A scale model of a Concordia yawl, complete in every detail, was built by A&R's model builder, Herr Potzka. It arrived unheralded in the forecastle of the 75th boat built by Abeking and Rasmussen, Westray. Waldo sold the company to Bill Pinney in 1969. Bill owned the company until 1981, helping to solidify the good reputation the company had built. During this time, Concordia continued to build the Beetle Cat sailboat, and began developing its facilities to accommodate the ever-increasing need for boatyard services on quality fiberglass yachts. Brodie MacGregor first visited Concordia Company in 1964 with a New York Yacht Club cruise and developed an immediate fondness for the town of Padanaram and for Concordia Company itself. Ten years later, after earning an M.B.A. from Harvard University, Brodie moved to Padanaram just 2 blocks away from the boatyard. He worked in the office for three years and ultimately purchased the company from Bill Pinney in 1981. 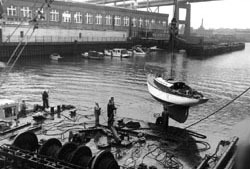 The Howland Family, who originally split the business and the property of South Wharf in 1969 when they sold the business to Pinney, put the South Wharf property on the market in 2006. Concordia failed to win the bid to retain the waterfront property. 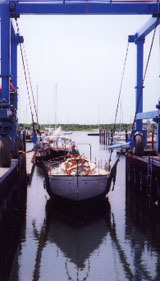 As of August 1, 2007, Concordia Boatyard moved full operations to its 14 acres at 300 Gulf Road, purchased by MacGregor in 1987 one mile west of Padanaram Harbor. The property was formerly home to Concordia Custom Yachts (generally fiberglass custom boatbuilders), and Hunt Yachts. Concordia Boatyard also used the property for storage. 300 Gulf Road offers superior workshop space and building facilities combined with room to expand. Concordia continues to do what they do best -- offer all aspects of yacht maintenance and project work with excellent customer service at an economical price.